We’ve all heard the famous Proverbs 22:6 verse, “Train up a child in the way he should go and when he is old he will not depart from it.” But how, exactly, are we to train a child? 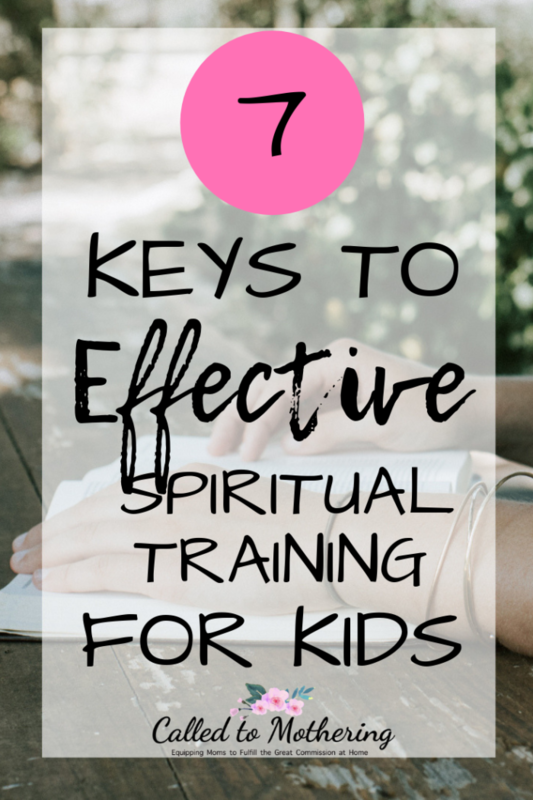 Between laundry, cleaning, throwing dinners together, and keeping the kids from destroying the house and each other, training our children spiritually seems like an impossible task. It is our responsibility, however, to point them to the Truth in God’s Word and live it before them daily. I promise you- it’s not as overwhelming as you think! These 7 keys to spiritual instruction break down this task into manageable pieces. Chances are, you’re already in the habit of reading books aloud with your children. Adding a children’s Bible to your routine will help your kids love God through learning about His character. Collect a few different “storybook type” Bibles with varying levels of maturity, and then gradually read them sequentially to your children as they get older. I recommend The Jesus Storybook Bible and Egermeier’s Bible Story Book. When they’re able to read and write on their own, have them read through the Bible from beginning to end, journaling at least one thing they’ve learned and one life application. This way, by the time they’ve hit their pre-teeen years, they will have already read through the Bible several times, and gained an understanding of how both Old and New Testaments fit together. Once they have an overview of the Bible as a whole along with its themes, move on to challenge them to study certain books in depth. Since it is practically impossible to train our children to to be experts on all 66 books of the Bible in 18 years, there is wisdom in focusing on several key books. I suggest Genesis, Proverbs, Psalms, at least one Gospel, and at least one doctrinal epistle. Generations Ministry has great study guides for digging into these books. In addition to reading the Bible for distance and depth, it’s important that children grasp fundamental biblical truths. A fun and easy way to do this when they’re little is go through a catechism together. Catechism sounds archaic and stuffy, but it is really just a summary of the teachings of God’s Word. A catechism can help your child understand essential truths such as the doctrines of the Trinity, justification, sanctification, God’s covenantal promises, the nature of the Church, and the problems with major heretical worldviews. It’s great because it’s laid out in a Q & A format, and kids love asking questions! While I might not have the answer for everything, it’s nice to have concise answers for some of my children’s Bible-related questions. I’d recommend using the Catechism for Young Children, based on the Westminster Shorter Catechism. Big Truths for Little Kids: Teaching Your Children to Live for God is also great if you’re just starting or looking for a survey of all the questions. Our kids should also have a good handle on apologetics. This is another one of those big, scary theological terms that put most parents off, but the word simply means “defense”. So, apologetics therefore is a defense, specifically of the Christian faith. In this cynical culture we live in, our kids need to be equipped with a way to defend what they believe. Apologia has an excellent series called What We Believe that is good for kids of varying ages to go through together. The books and accompanying journals explore a biblical worldview of God and Truth, Self-Image, Servanthood, and Stewardship. Letting your children express their needs, as well as their praise reports, is so important to building their faith. And letting them pray for each other is powerful. I provide my kids with the “PTR” framework for prayer: praise (what you love God for), thanksgiving, request. Take the lead in praying with your children not just before meals and bedtime, but at various times during the day. Check out my post on teaching your child how to pray for tips on helping them develop this discipline. Another powerful way to point your kids to Jesus is by filling your home with worship music. Praise & Worship helps set the tone for the day and creates a Christ-centered environment for your family. Create a playlist on Pandora or iTunes and add favorites from each of your children. Let them sing their hearts out and then work through the lyrics to discuss what they mean. Even passive listening is great for kids. As they listen to the lyrics, their hearts and minds are filled with truths of God’s Word and their focus shifts to what’s most important. I often find my daughter going around the house absentmindedly singing praise songs we’ve listened to throughout the week. It’s great to add hymns into this mix as well so your kids appreciate them and their rich message. Besides hearing and reading God’s Word, our children should meditate on it. Committing Bible verses to memory has tremendous value for ingraining the truths of Scripture in their minds. 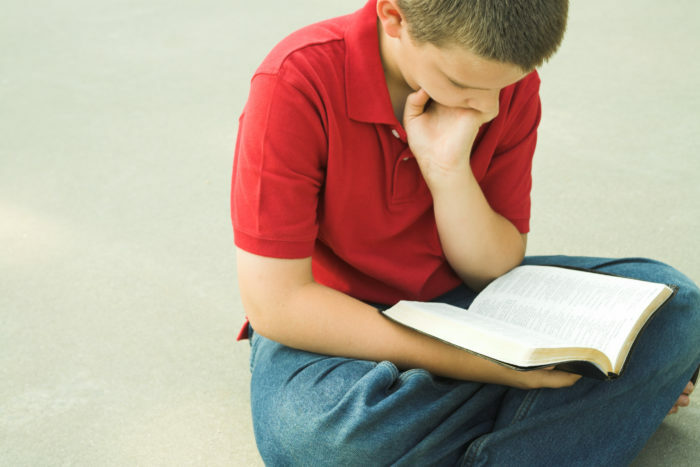 A good way to help your child memorize a verse is through repetition. Repeat it several times throughout the week. Whisper it, shout it, say it in the car, at meals, and at bedtime, and… sing it! My kids love singing along to catchy Scripture songs by The Harrow Family. For children that can write, have them copy down the verse each day. Make a Scripture Box full of index cards with different passages on them. Then, grab a card from the box once a week or so, discuss its context, and make it your memory verse for that week! Children imitate what they see. If they see you putting God first, taking your concerns to Him, and reading your Bible regularly, they will, in turn, be more likely to model that behavior. If they see you missing church, using the Lord’s name in vain and other behaviors which do not honor God, they likely will not honor God. Spiritual training, like any discipline, requires diligence and intentionality. It takes planting those little seeds of faith in your kids, incorporating the Word of God and the Gospel message into the rhythm of daily life. The fruits of your labor likely won’t be glimpsed for many years, but your children will be well-rooted in biblical truth so that when they’re old, they won’t depart from what you’ve taught them. Be sure to check out the other posts in the Rock Motherhood Biblically Series here. Full of practical tips, this series will help you more effectively train your children and manage your home so you can rock motherhood biblically this year!